Recruitment is a two sided market, ripe for intermediaries to eliminate (or create) deadweight loss. Right now, there’s a lot of deadweight loss. There’s a major gap in the job market, starting with the U.S.’s 4.5 million job open positions and 9.8 million unemployed people. 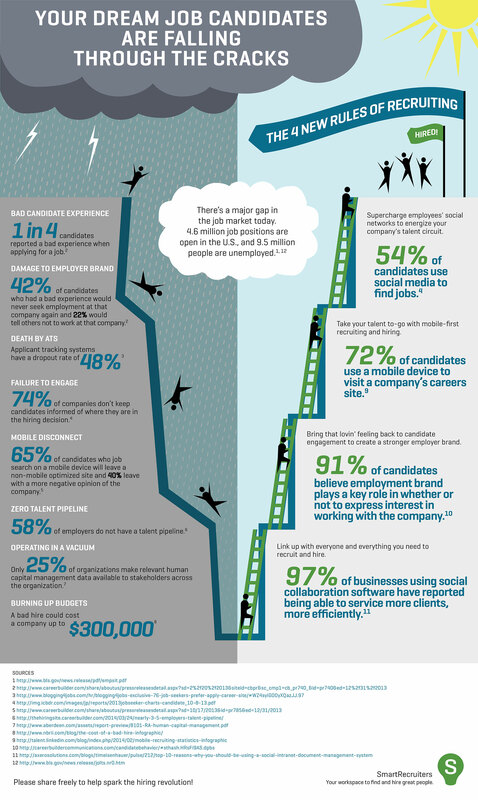 This SmartRecruiters infographic provides insight the depth of the hiring gap. 1 in 4 candidates already had a bad experience when applying for a job. More than 1 in 2 candidates use social media to find a job. Make sure you career page is mobile friendly! 72% of candidates access this page with a mobile device. A bad hire could cost a company up to $300,000. RELATED: Do HR Professionals Fail to Control Their Own Careers?